Watch the new trailer for the action thriller Skyscraper and you will know pretty much everything there is to know about the film. The three-minute trailer appears to lay out the entire story, although we can hope there will be a twist or two during the actual movie to keep audiences engaged. 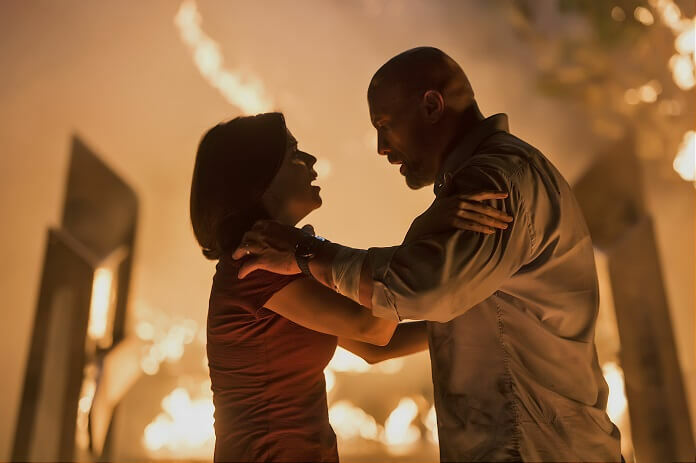 Dwayne Johnson (San Andreas, Rampage) stars in the action film with the “When it comes to family, nothing will stand in his way” tagline. The cast also includes Neve Campbell (House of Cards), Chin Han (Ghost in the Shell), Noah Taylor (Preacher, Peaky Blinders), Roland Møller (Atomic Blonde), Byron Mann (Blood and Water, The Expanse), Pablo Schreiber (American Gods, Den of Thieves), and Hannah Quinlivan (Moon River). Skyscraper was written and directed by Rawson Marshall Thurber (Central Intelligence, We’re the Millers). The thriller is produced by Dwayne Johnson, Rawson Marshall Thurber, Beau Flynn (San Andreas, Baywatch), and Hiram Garcia (San Andreas, Central Intelligence). Dany Garcia (Baywatch, Ballers), Wendy Jacobson (San Andreas), Eric McLeod (Kong: Skull Island, Pirates of the Caribbean series) and Eric Hedayat (The Great Wall, Real Steel) served as executive producers. Universal Pictures has set a July 13, 2018 theatrical release date in 2D and RealD 3D.